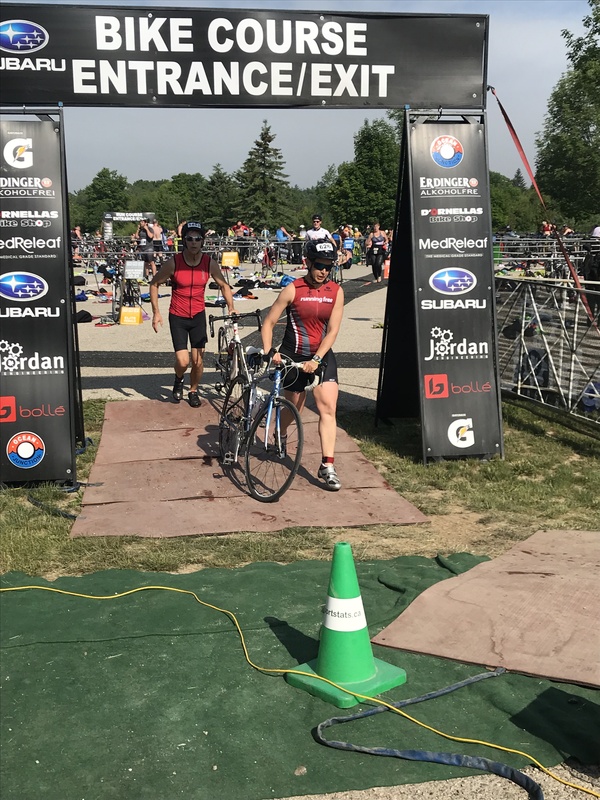 Some of my friends competed in the Olympic tri, which took place on Saturday June 16, and then set up a camping site at the Conservation Area. I drove up and joined them on the Saturday evening and camped overnight. It was surprisingly comfortable and convenient to wake up a few minutes away from the starting line of the race. I made sure to wake up early on race day to give myself time for some oatmeal and to calm my nerves. We left our tents and biked over to the starting area where I registered (which included signing waivers and picking up my race bib, timing chip, t-shirt and product samples) and then focused on getting my stuff organized in transition. By 9:00, I was more than ready to go. Since I’m not the strongest swimmer, I positioned myself towards the back of my wave. It was a surprisingly “violent” swim – I think I had someone’s feet in my face almost the entire time. It was also a little bit choppy, so I ended up eating some waves as I was trying to breathe. I did my best not to panic and just focused on continuing on. Overall, it was on ok swim – especially considering this is my weakest sport of the three. I finished in about 19 minutes, which seems longer than it should be because it includes a run up a hill to the timing mat at transition. I tried to hustle through transition although I felt like I was in slow-motion. The bike course was an out-and-back route. The first long stretch was quite gravelly and hilly (the pavement for the first 5k was quite rough), but the rest of the course had some gentle rolling hills that were pretty manageable. In fact, I never thought this would be the case but the bike portion was my favourite part! A solid ride for me would be 20k in under 60 minutes – so I was pretty happy to see that my pace was just over 26km/h and finished in 43 mins and change. This run was HOT! Even though I felt like my legs were jelly from the bike ride, I still managed to keep a fairly decent pace. In fact, I finished the 5k run in under 30 minutes, which I am super proud of. Overall, I reached the finish line in a time of 1:37:33. After the race, athletes were given subs, fruit, pita chips, granola bars and Gatorade. The course marshaling and volunteers were great, and it was awesome to see so a few other Running Free athletes on the course. This was a great event, and I will totally consider doing it again next year!